While most of the hidden object games present you with lists of still-life items to find, Gotcha: Celebrity Secrets challenges you to pluck people out of large crowds in a “Where’s Waldo” style game, but with a delightful, gossipy feel. In Gotcha: Celebrity Secrets we meet Gaby, a young lady who fosters a secret ambition while working at a typical ‘nine to five’ job. Instead of preparing reports or taking care of her boss’s lunch, she immerses herself in her true passion – running a celebrity gossip blog! When a competition is announced, offering the most popular gossip blogger an exclusive interview opportunity with megastar Eric Von Hunk, Gaby is determined to win, to defeat her biggest rival Dante and claim the glory of being Hollywood top blogger. 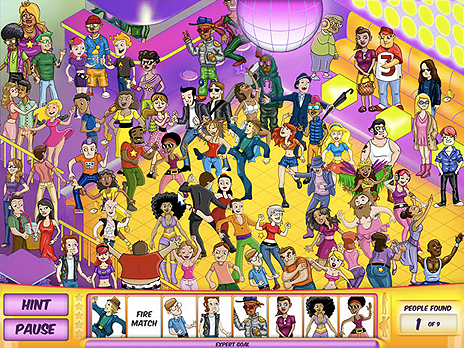 The game includes 5 chapters, each dealing with a different blog assignment. Each chapter requires Gaby to gather gossip for 8 different blog posts. As you help Gaby decipher clues and gather gossip so that she can add posts to her blog, you help her improve her rank in the Hollywood Gossip Association. Each post assignment begins with Gaby receiving a mysterious SMS containing a clue as to where and when a celebrity can be spotted next. When the scene starts, it is packed with all sorts of colorful people out of whom you must then locate Gaby’s informants either by spotting them directly, identifying them by a description, or by their outline. As you progress from scene to scene, they become more and more crowded, making the informants more challenging to find. Along the way you can collect bonus points by locating other items in addition to the informants. Collecting the bonus points earns you “money” or points with which to customize the appearance of Gaby’s blog, among other things. You can also look for hidden pocket watches within the scenes that will freeze the timer and help you reach higher scores. Between each scene there are delightful mini-games and puzzles to solve in order to progress to the next post assignment, adding to the fun and cheery atmosphere of the game. 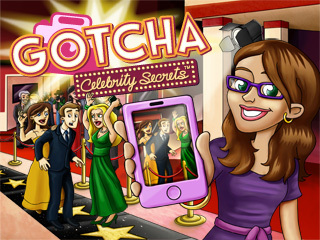 If you’re a fan of hidden object games, then Gotcha: Celebrity Secrets is a fun variation from your typical hidden object experience. And if you’re into celebrity gossip or are interested to see how a celebrity blog takes shape, then this is a game you won’t want to miss!